June 4th 2018 marks the 14th anniversary of the dozer's rampage through Granby Colorado. Marvin Heemeyer was a man who owned a muffler shop. The city council approved the construction of a concrete factory in the lot across from Marvin's shop. In the process this blocked the only access road to the muffler shop. Marvin petitioned to stop the construction to no avail. Petitioned to construct a new access road, and even bought the heavy machinery to do so himself. Denied. The concrete factory went up in disregard to the ramifications on Marvin's business. To add insult to injury, the factory construction disconnected the muffler shop from the city sewage lines. An indifferent city government then chose to fine Marvin for this. His business and livelihood were in ruin. Rather than lie down and die, Marvin chose to fight back. Over the course of a year and a half Marvin secretly outfitted the bulldozer he bought to save his business with one foot thick steel and concrete armor. For visibility, the bulldozer was fitted with several video cameras linked to two monitors mounted on the vehicle's dashboard; the cameras were protected on the outside by 3-inch shields of bulletproof plastic. Onboard fans and an air conditioner were used to keep Heemeyer cool while driving, and compressed-air nozzles were fitted to blow dust away from the video cameras. 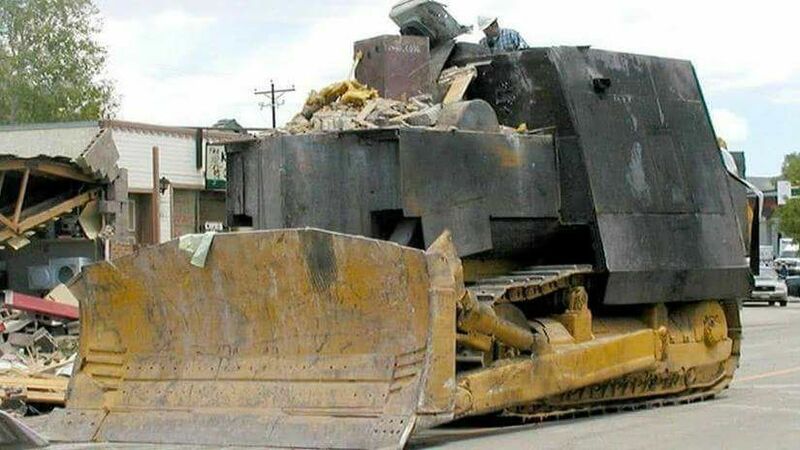 On June 4th 2004 Marvin Heemeyer lowered the armored shell and made his last stand. He burst fourth from the walls of his muffler shop and straight into the concrete factory that ruined his business. Over the course of the next several hours Marvin drove his dozer through 13 buildings owned by those officials that had wronged him, including the city council building itself. Swat teams swarmed the dozer, but it proved immune to small arms fire and even explosives. Another piece of heavy machinery was even brought out to fight the dozer, but it too fell to the dozers righteous fury. In the end, Marvin's dozer became trapped in one of the buildings it was built to destroy. Marvin chose to take his life, the only life he took that day. Marvin Heemeyer, the man driven to the brink who chose to fight back. From notes left behind after his passing: "I was always willing to be reasonable until I had to be unreasonable. Sometimes reasonable men must do unreasonable things." I watched the video several times and can't believe it. Fascinating story. I have some respect for this guy.